We are in the second week of June and already melting through our first heatwave of the summer. The temperature today is expected to reach 99*F (37*C) with temps climbing to 101*F (38*C) tomorrow and remaining about the same over the next 16 days. Truly, it feels like we are walking on the surface of the sun and it is only June! #WhyDoesItFeelLikeAugust? The kids and I are hiding out inside in the AC enjoying a Wii marathon and dreading the swim meet we have to go to tonight (or at least I am) but how are the new plantlings managing outside? I didn’t put them in all that long ago and certainly not enough time has passed for them to have established robust root systems. They all may well fry within the next two weeks. Sigh. But I’ll tell you what I did do to help get them through the start of a brutal summer. 1. Install drip irrigation systems. I love drip irrigation. It is easily found at all the big box stores, is not that spendy, and is easy to DIY. I have it all through most of my gardens and they are all connected to timers which, really, is my favourite part about the drip irrigation – I don’t have to keep remembering to turn the water on, move the sprinklers, or turn it off again! The ultimate in set-it-and-forget-it lazy gardening. Drip irrigation also increases water efficiency as the water is only ever placed exactly where it needs to go – at the root zone of each plant – rather than sprayed from above drenching everything in the garden whether it needs watering or not. The effects of evaporation can be lessened when the timer is set to water in the early morning hours before the sun rises, and reduced once again if the emmiters are placed underneath the mulch. Just awesome all around. Not only does a thick layer of mulch smother out any weeds but it acts as a barrier between the hot burning sun and the soil underneath, literally holding the water in the ground and preventing it from being evaporated by the sun. It also helps regulate the temperature of the soil reducing stress on plant roots. I spent last weekend adding an extra few inches of mulch around the plants I thought would be most vulnerable to the weather this week. I hope it helps. When I water I try to water more deeply but less often, say 20mins, 3 times a week rather than 10mins a day. This encourages roots to dig deeper into the soil in search of water rather than staying close to the surface in order to sip at more frequent water sprinklings that never get to soak in. Long term, a nice deep root system will produce a more robust plant that is better able to handle temperature extremes as the added layers of soil the plant has above its roots will insulate the roots from the temperature changes. Clever, right? I don’t remember where I heard this tip but I’ve been using it for years and it really helps. Try putting a (clean) baby diaper in the bottom of your hanging baskets and pots. 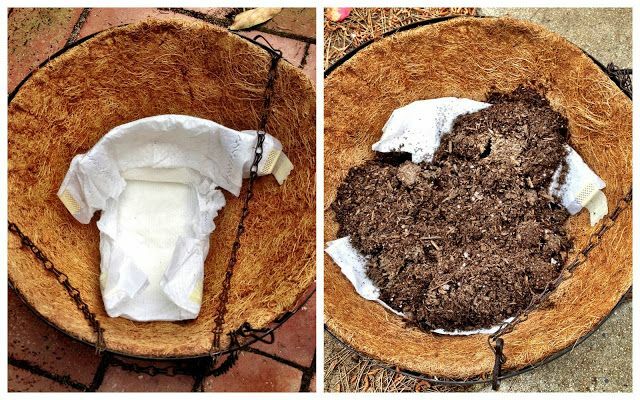 The crystals inside the diapers will retain lots of water which the plants can ‘sip’ from when they start to get dry. At the end of the season you can just throw the diapers away as you normally would, or even dry them out and keep them for next year. They last quite a few seasons (it’s not like the crystals wear out) and I feel less guilt if I get a few uses out of them rather than just adding them to the landfill so quickly. Admittedly, not all my plants are perfectly sited and some are probably in more sun than their labels said they would like (sigh) but with these added measures maybe I’ve done enough to help get them through the worst of this weather. Fingers crossed! ← It’s The End of the World … I Mean School Year. Strange reading about your heat wave, when I am in winter. Interesting that in June you are getting August weather – heat earlier. In May, our Autumn we actually had snow. You would know why that is mad for this area. It was light and brief but it was snow! I had no idea about the baby diaper trick! My hanging basket seems to be bone dry almost daily. I am going to have to give that a try!